Welcome to the Tropentag 2018 blog! Follow us for live updates from student reporters on conference sessions, side events and more. It is bright and early (or just early, as it's not quite yet bright) on day one of Tropentag 2018. 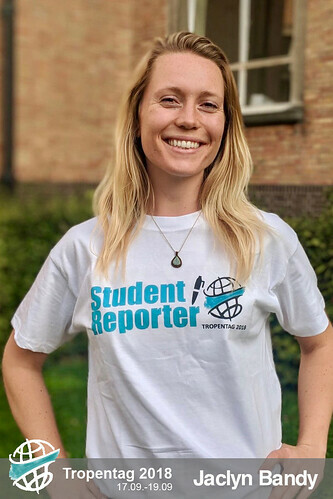 The student reporters have been in Ghent the past two days and are excited to cover many events in the next three days and have a little bit of fun on the side. As the conference unfolds, you'll see us in our white t-shirts (we'll be taking great care not to spill on them) running around like busy little bees. Please feel free to approach us if you'd like your poster, presentation or general self documented here within our blog or on Twitter, Flickr, YouTube, Instagram, Facebook or Medium. You can follow us at #Tropentag2018, and we wish you all great success and much fun over the coming days. Diana Santos is a nutritionist from Saposoa (San Martin, Peru) enrolled in the master of Nutrition and Rural Development program at Ghent University. She has worked in projects related to health promotion, food security, food sovereignty, agroecology and nutritional education in the Andean region of Peru. Encouraging farmer families and primary students in rural areas to improve their food intake and consequently the nutritional status of the communities. Onu Ekpa hails from Nigeria. He is a PhD candidate in Food Quality and Design at Wageningen University, The Netherlands. 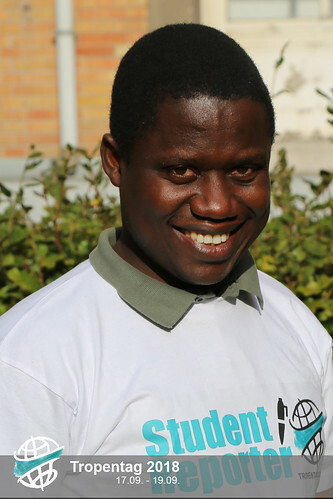 He is the current president of UCAS – United Community of African Student, Wageningen. Onu believes that in contemporary society, aside from being a good scientist, it is imperative to be able to communicate effectively to a wider audience. Through effective communication, a scientist can build a positive image of science to the general public, especially to the likes of those still clutching at the straw of disbelieving or denying climate change and other scientific facts around us. Being a student reporter gives him the opportunity to improve his communication of research and interact with people from diverse background. He is passionate about value addition to agricultural produce and creating opportunities for the youths. He hopes to cover the conference sessions on food technology, safety and security. You can follow him on Facebook, Linkedin and ResearchGate. Kehinde Odeniyi (Kenny) is concluding his PhD in Agricultural and Food Economics at the University of Reading. His research interests include Climate-smart agriculture and agricultural technology adoption and disadoption. He is keen to make contacts at Tropentag 2018 leading to a post-doc next year. 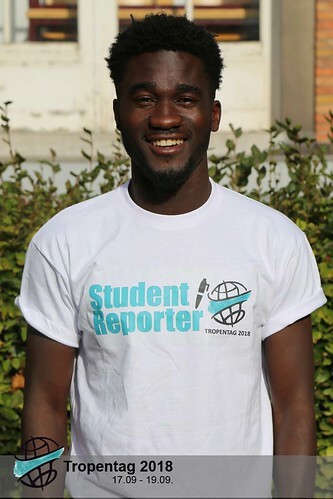 As a student reporter at Tropentag 2018, he is bringing his experience as an author of three books, newspaper columnist and television presenter to bear. 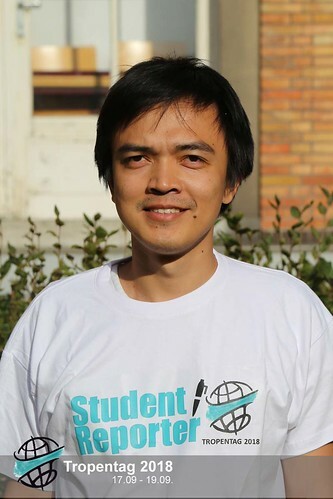 He is responsible for the Tropentag 2018 page on Medium.com, interviews and a member of the editorial team. He plays Chess and Scrabble in his leisure. Jaclyn, aka Jackie, is a MSc student from California, USA. She studies Agriculture Science and Resource Management for the Tropics and Subtropics (ARTS) at the University of Bonn, Germany. Jackie did her B.S. in Animal Science at California Polytechnic University and recently carried out her master's thesis experiment in Sustainable Nutrition for Aquaculture at FiBL Research Institute for Organic Agriculture in Switzerland. Last year she helped host Tropentag in Bonn and it was an exciting, insightful experience. 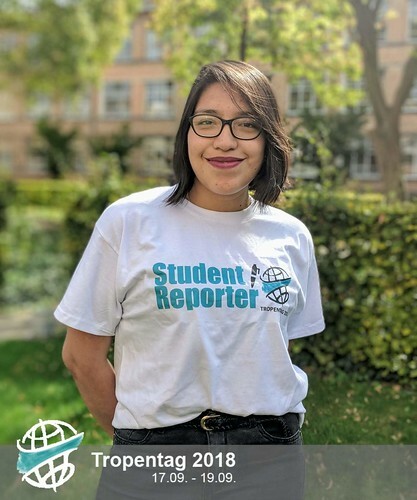 Because she loves science and bringing passionate people together, being a student reporter for Tropentag 2018 seemed fitting. With such a diverse spectrum of attendees, she believes it is pivotal to capture the highlights and impressions of the conference; from experts, to young scientists and students alike. She looks forward to illustrating the various presentations and genuine interactions throughout the conference. With scientific knowledge transfer at the foundation for success in understanding the world and each other, she hopes that Tropentag 2018 can show that universities are playing a great role in the quest for sustainable and inclusive development in agriculture. Malik comes from Indonesia. He is now studying in a master program with field of study Tropical Hydrogeology and Environmental Engineering at TU Darmstadt, Germany. He had experience working in a Peat Ecosystem Restoration project at Central Borneo, Indonesia. There grown his concern to peat ecosystem and his desire to involved in a bigger action to that. He applied for Student Reporter at Tropentag 2018 because he wanted to expand his network in this field and develop the ability to communicate science in fun and encouraging way. Which in fact he got it already since the day one of the workshop. Some funny thing happened when he was in his way from Darmstadt to Ghent. He saw these two people got in the bus from Bonn. Because he was sitting next to them, he could listened to them talking all the time during the trip. Turns out these two person are Jackie and Kobbe, another Student Reporters from Bonn. “I had this small feeling but would it be weird to ask?” said him while laugh. Fun fact about him is that he owns 7 cats in Indonesia.